"This thought-provoking book takes a wide sweep through the cause of corruption and its historical reality. It is a problem that will never disappear but must be constantly challenged and contained. This book will assist the struggle." -Clare Short, Chair of the Extractive Industries Transparency Initiative (EITI) and former Secretary of State for International Development, UK. Recent scandals in Canada, laid bare by Quebec's Charbonneau Commission and the press, have shown how a tight network of city bosses, construction kings and political fund raisers can determine the award of major contracts and the financial power of political parties. The fact that three mayors of cities in Quebec have been obliged to resign on corruption related allegations charges since October is testimony to the depth of the problem. However, 'embedded networks' of this kind are common across the globe and frequently determine the allocation of resources in ways which destroy public trust and often create huge inefficiencies in public works. In my book, 'Global Corruption', I explore the ways in which these networks operate in a range of countries, in many cases creating a downward spiral which makes corruption endemic and an every day issue for at least half the world's population. Even across the twenty seven countries of the EU a recent poll showed that two thirds of the population consider corruption to be a 'serious problem' in their own countries, with 'political corruption' at the top of the bill. In the US the recent Presidential campaign was accompanied by unprecedented disquiet over the role of the $2.5 billion invested by both parties, some of it from tainted sources. The raising of political finance from corrupt sources, including organised crime and 'off the books' corporate accounts, has a long pedigree. In the case of Italy, the Sicilian based mafia was a player in national politics for most of the last century, with a particularly well defined role since the 1950s, leading to no less than four prosecutions of Prime Minister Giulio Andreotti on mafia related charges. In South Korea, two ex-Prime Ministers were prosecuted (and imprisoned) on corruption charges in 1996 and one (Roh Moo-hyun), faced with bribery charges, committed suicide in 2009. In India the cost of elections has reached the enormous figure of US$10 million to win a seat in the federal Parliament - a sum which can only be raised through corruptly gained contracts, creating a situation where the 'investors' have to achieve a return on their investment by securing a further round of corruptly awarded contracts. In South Africa, the Euros 5 billion arms deal of 1998 was structured to include large scale payments to the governing ANC, then in power for four years. In Brazil thirty seven Congressmen were charged in the 'mensalao' case in September 2012 with receiving bribes from the executive to pass more than twenty five laws in a Congress in which there was no overall majority. (Twenty five of them were found guilty in the Supreme Court in October). "Much of this funding comes from a combination of organised crime and the skimming of large scale contracts, especially in defence and infrastructure. In some cases both local and international companies may pay bribes which are destined to be indirect political contributions." Much of this funding comes from a combination of organised crime and the skimming of large scale contracts, especially in defence and infrastructure. In some cases both local and international companies may pay bribes which are destined to be indirect political contributions. In 2008, the new CEO of Siemens, Peter Loscher, said that total identifiable bribes paid by the company in twenty countries, in the recent past had totalled as much as US 1.5 billion. In several cases involving BAESystems investigated by the US Department of Justice and the UK Serious Fraud Office in 2010, leading to $440 million in fines, payments were partly channelled to political parties. In Russia, the election of 2003 saw an investment of $100 million by Mikhail Khodorkovsky (and his Yukos company) in support of the election of a hundred deputies, rivalling a similar but not so challenging investment by Gazprom (leading to the jailing Khodorkovsky in Siberia). Political finance of this kind sets the scene for the various forms of corruption which impact on people's lives. Not all small scale or 'petty' corruption is the product of a need for survival by those on drastically low pay, a significant part of that is orchestrated by those in more senior posts who expect a cut from the policeman on the streets or the medical orderly in the hospital. Political posts are sold off in many cases for a capital sum: Transparency International (Russia) reported this to be as high as $8-10 million for a Deputy Minister's post in 2005. These payments at both the small and large scale level are facilitated by the fact that forty per cent of GDP, or more in ex-Soviet and low income countries, may be unrecorded and part of a 'shadow economy'. This constitutes a huge reservoir from which payments may be made and cannot be detected. In the case of companies, payments may be made from both unrecorded and recorded output to 'secrecy jurisdictions' - such as the UK's Caribbean 'Overseas Territories' - which in some cases flow back to their country of origin as political donations as well as 'foreign direct investment'. The best estimate of these flows is about $1 trillion per year, a sum of immense value to the Wall Street and City of London banks who have subsidiaries in these jurisdictions. "In the case of companies, payments may be made from both unrecorded and recorded output to 'secrecy jurisdictions' - such as the UK's Caribbean 'Overseas Territories' - which in some cases flow back to their country of origin as political donations as well as 'foreign direct investment'. The best estimate of these flows is about $1 trillion per year, a sum of immense value to the Wall Street and City of London banks who have subsidiaries in these jurisdictions." This tangled web of inter relationships at grass roots, corporate and political level is very difficult to unravel. The most positive initiative lies with the G20 whose working group on corruption has focused on several of the key issues in the last two years. It is the influence of this group which caused China, India, Indonesia and Russia to pass legislation outlawing overseas bribery in 2011. For the next six months the group is co-chaired by Russia and Canada - an excellent opportunity for Canada to show that it is putting its own house in order, as it seeks to move the G20 on to address on an international basis some of the issues discussed in this book. 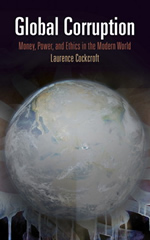 Laurence Cockcroft is a development economist who has worked for governments, international organizations, and private- and public-sector entities. He is a founding member of Transparency International and was formerly chairman of its UK chapter. He is the author of Africa's Way: A Journey from the Past.